Most of the female characters on Teen Wolf seemed to be quite short lived, which is unfortunate as they are almost always more interesting than their male counterparts. One character whom we wish had been given more attention throughout her run was Erica Reyes. Erica is first introduced in the second season as a meek teenager suffering from epilepsy. After being turned into a werewolf by Derek she is given a newfound confidence, a newly flexible take on morality, and a new badass makeover. From her combination of sweats and messy hair to her bombshell cafeteria introduction it is clear that this new Erica is not to be trifled with. Her leather in leather look coupled with the blood red lipstick and stiletto heals is classic femme fatale and we love it! 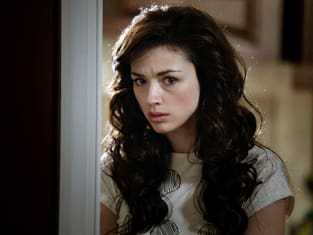 Along with Allison Argent, this is a character who was instantly missed once she was killed off. Teen Wolf Season 2 Episode 3: "Ice Pick"
Our sons are trained to be soldiers...our daughters, for leaders. Allison: Is this how we're gonna do father-daughter talks from now on? Chris: No, this is how we're gonna train you. Teen Wolf Episode Teaser: "Ice Pick"